By: Daniela Aiello, Lisa Bates, Terra Graziani, Christopher Herring, Manissa Maharawal, Erin McElroy, Pamela Phan, and Gretchen Purser, Shelterforce. Eviction Lab Misses the Mark: By not working with existing housing justice organizations, the high profile organization undercounts evictions and misses a chance to understand differences between localities and wider policy analyses. There is perhaps no more influential and popular book on poverty and housing at the moment than Matthew Desmond’s Pulitzer Prize-winning Evicted. The book provides narrative accounts of Desmond’s time following very poor tenants and their landlords through the conditions that lead to, and follow after, evictions in a mobile home park and a poor urban neighborhood in Milwaukee. The book also integrates Desmond’s quantitative analysis of Milwaukee court records of evictions that he collected and other social scientific research to give the stories context, policy analysis, and policy recommendations. In his research, Desmond expressed frustration at the lack of data on evictions, and set about trying to correct it. In May 2018, Desmond released the first national eviction database through his Eviction Lab at Princeton University. Its aim is to help users “discover new facts about how eviction is shaping your community, raising awareness and working toward new solutions.” The project, which allows online users to easily view eviction trends in their neighborhoods and state, has been hailed as “a gift” for housing activists, and received widespread praise from academics, policymakers, and journalists alike. However, the methods the Eviction Lab has used to gather its data, as well as some of the policy assumptions being made based on that data, raise critical questions that have yet to be meaningfully engaged. As housing activists and academics who conduct research on issues of housing and displacement, and who are involved in multiple housing movements across the United States and Canada, we have encountered major problems with Eviction Lab’s practices of big data production, Desmond’s mode of public engagement, and the analysis and solutions offered in Evicted. The Eviction Lab’s goal of gauging the number of evictions across the nation is important, but a number of questions arise from the methods that Desmond and his team favor. Desmond’s team has collected data primarily in two ways: First, by approaching community-based groups who have been engaging in eviction defense and data work for some time, and second by enlisting big data companies to obtain what they could not from smaller groups. Prior to Desmond’s Eviction Lab, a number of local organizations had been working for years to collect and publicize eviction data. Groups like the Anti-Eviction Mapping Project (AEMP) in San Francisco, Alameda County, Los Angeles, and New York City; JustFix NYC in New York City; Tenants Together in California; and City Life/Vida Urbana in Boston have all been instrumental in bringing attention to the eviction crisis. Many of these groups were asked by Desmond’s team, specifically research assistants from Harvard and Princeton, for their data. Some of the groups were consulted about their eviction data methodology. While groups such as the AEMP, which some of us represent, are committed to sharing data with community partners and those with shared politics, eviction data is delicate. We have processes and methods for keeping sensitive data about people’s evictions private. We also don’t want to create data sets that can be potentially used by the real estate industry against tenants and tenant organizing. Unfortunately, the Eviction Lab’s team wasn’t initially forthcoming about what data protections they had in place, nor did they articulate a clear political program of how the data would be used to advocate for policies to protect the tenants in the communities we work in. We asked for further clarification on how the team was handling these issues so we might collaborate, but we never received an adequate response. Rather than working with community groups to address our concerns so they could use the statewide data we had already collected, the Eviction Lab team stopped talking to us and chose to purchase California eviction data covering the same areas for $100,000 from American Information Research Services, a group that lists on its website “tenant screening” as a service they offer. Companies such as this profit from selling its eviction database to assist landlords in not renting to “high-risk” tenants, who are often low-income people of color. Desmond often criticizes scholars of poverty for ignoring the myriad ways that poverty is profitable. In Evicted he writes, “Exploitation. Now, there’s a word that has been scrubbed out of the poverty debate.” However, Desmond seems to have no concern about paying corporations that profit from, exploit, and aid in evictions. Even more troubling is the fact that the California data gathered by the corporation is not nearly as complete or accurate as that gathered by community organizations in the state. In fact, Desmond’s purchased data on California evictions is a vast undercounting of the evictions that have occurred. AEMP and Tenants Together have found three-times the amount of evictions in California as Desmond’s Eviction Lab show. According to the Eviction Lab, in San Francisco, 1,440 eviction filings took place in 2014, and 1,347 in 2015. AEMP and Tenants Together’s data shows 3,310 in 2014, and 3,512 in 2015—more than double the Eviction Lab’s count. The community-led data collection is far more comprehensive. Since 2013, AEMP has worked in coalition with tenant groups like Tenants Together to compile and analyze numerous data sets tracking eviction, including records from county courts and city rent boards—both retrieved through laborious, drawn-out record request processes—along with survey data obtained through eviction clinics and narrative and qualitative interviews with tenants. Yet, because of the social (and economic) capital of Princeton University, the Eviction Lab, and Desmond, media, policy, and academic reporting alike is more likely to pay heed to Eviction Lab data than to that of smaller groups that understand the lay of local displacement lands much better. After this undercounting was pointed out to them by Tenants Together, the Eviction Lab team added a barely visible disclaimer to their site. However, the incorrect values are still prominent, and policymakers in several California cities are still citing the incorrect numbers in deliberations on important policy decisions for tenant protections. Inevitably, press and other researchers will cite them as well. Desmond and his team could have added a link to Tenants Together or AEMP, directing folks to the more accurate numbers and more transparently correct their data. This would also have uplifted the efforts of grassroots groups more embedded in the on-the-ground crisis Desmond claims to want to fix rather than continuing to minimize their research. AEMP also wanted to know how it would receive attribution for its data. Multiple times, university researchers and projects have tried to use its data for their own purposes and without giving credit or funding to the grassroots volunteer-based project. It soon became clear the Eviction Lab had no protocols in place to offer credit to groups from where it obtains data. Nor did the Lab, a research outfit rich in resources that had no qualms paying for-profit corporations that were assisting landlords, offer compensation to these groups for using their data. Groups in other parts of the country, for instance in Boston and New York, were also contacted by Desmond’s team for their data, and also weren’t offered compensation, or initially even attribution. Desmond intends for his projects to be tools for policymakers and a platform for local groups. However, we have already observed instances when Desmond’s presentation of incomplete data has undermined the data analysis and policy work of local community groups and scholars in other cities. For instance, in Portland, Oregon, advocates wanted to educate elected officials in advance of a state legislative session that would consider a change to language that eliminated no-cause evictions in favor of a just-cause standard. Given Desmond’s stature as the national expert on the impact of eviction, housing advocates paid for him to speak at a breakfast with key leaders. Despite some attempts from grassroots advocates and their academic partners to be in contact with Desmond’s team ahead of the visit, he did not consult with them about either Oregon’s relevant state laws or the experiences of organizations working on the ground with tenants. By the time of the breakfast, Desmond had given interviews with local press saying that restricting no-cause evictions needn’t be a policy priority, since most evictions are for nonpayment of rent. While this may be true nationwide, his analysis had not been contextualized for Portland, which is a rapidly gentrifying city where tenants mostly rent month-to-month with leases that can be ended with just 30 days’ notice and no recourse. Unlike in Milwaukee, his main research site, renters in Portland are losing their homes to double-digit rent increases, building “flips,” and upgrading. Because of the urgency of these problems, statewide grassroots advocacy group Community Alliance of Tenants (CAT) and other advocates had already won an emergency ordinance that extended notice periods for no-cause evictions from as little as 30 days to 90 days, even for month-to-month tenants, and sought further protections from the state and local governments. However, Oregon allows no-cause evictions without any formal court filing, and so Desmond’s data shows only a very small part of the story of renter instability in the state. CAT reports receiving an average of 2,500 calls a month to its renter hotline, a vast majority of which are about no-cause eviction or rent increases that amount to economic eviction. Audience members tried to explain this, but Desmond pushed back, insisting that just-cause standards and due process reforms were not worth it. Because they had CAT’s data, local advocates and policymakers were not convinced to abandon just-cause eviction as a goal. Nonetheless, Desmond’s presentation missed the mark and did not provide any help to anti-eviction advocacy in Portland. Desmond’s talks also come at a high cost to communities. He regularly charges $20,000 for nonprofit sponsored events that include some combinations of a talk, book signing, and roundtable or classroom discussion. While some of these funds are funneled back into Eviction Lab, the funding model raises troubling implications for academic and community relations. First, it makes Desmond’s practice of using community-collected data without compensation especially extractive. Second, it takes money from community groups—in this case Portland’s Housing Alliance, Multnomah County Library, and foundations who supported them—out of the community and into the academy. This practice is in stark opposition to the methods of community-based research engaged by the authors of this article, which instead attempts to transfer academic resources and wealth to the community groups they engage with, rather than the other way around. The Eviction Lab’s dataset is an important step toward providing a national picture of the eviction epidemic. As Desmond blogged on the launch of the Eviction Lab website, “Imagine if we didn’t know how many Americans were incarcerated each year or how many dropped out of high school, got divorced, or lost their job. If we don’t know how big a problem something is, where it is happening, or how many families are touched by it, then how can we begin the critical work of finding solutions?” Only a handful of major cities have local community groups organizing, publicizing, and analyzing eviction data at all, so the Eviction Lab is filling a large gap. However, in cities like San Francisco, Los Angeles, New York, Boston, and Portland that have grassroots groups that have already been collecting, and continue to collect, eviction data, Desmond has failed to engage with them as peers, and his work has failed to recognize and support the ongoing organizing, political struggles, and deep local-level work that his data project purportedly seeks to assist. Desmond’s Eviction Lab and Evicted have raised public and scientific consciousness of facts that community organizers, social workers, and lawyers had long realized—that evictions are increasing and widespread, are emotionally devastating, and disproportionately impact women of color. They are not just an outcome, but a cause of poverty. While Desmond’s works have provided powerful accounts of the eviction process and new empirical data on its prevalence, the book and the lab’s data do little to tell us why evictions are on the rise, let alone who beyond landlords and tenants are involved in the process. In Evicted, Desmond intimately observes landlords and tenants’ transactional relations, but never explores how the state, investors, and other key actors are involved in this process. Similarly, the maps and data (so far) tell us nothing of variations in regulation, or the roles of salient actors such as developers, property management companies, banks, and multiple alliances of political players. Desmond does not trace the plight of his subjects to structural causes but to their effects, namely the relations of eviction. In contrast, projects such as the AEMP are invested in analyzing what causes increased evictions. For instance, in the San Francisco Bay Area, AEMP has mapped connections between Silicon Valley infrastructure and eviction rates by mapping, for example, the effects of tech shuttle buses on evictions, tracking the loss of SROs in Oakland for “tech dorms,” and comparing Airbnb listings with eviction rates. The project has also created a tool to look up addresses and determine eviction histories and the speculators behind them, and has analyzed where tenants go after eviction and how evictions are racialized. It has also analyzed the effects of city and state policies on housing injustice, including eviction rates. Some of these maps also look to sites of community power and resistance, making sure to offer resources for collective reimagining and resistance. Central to this research are numerous community partners with whom research projects are created and implemented, assuring on-the-ground conditions are reflected in its political analysis. For instance, just recently the AEMP co-released a report with the California Reinvestment Coalition, which analyzes banks financing serial evictors in Oakland and financing’s roots in earlier redlining histories. This collaboration and report, like others that the group has produced, foreground the underlying causes of and actors in the city’s eviction crisis. Desmond’s ultimate policy solution is a universal housing voucher program, which would certainly alleviate the eviction crisis, but will require a long-term push of political will and does nothing to disrupt the profitability and exploitation in the landlord-tenant relationship that Evicted draws attention to. In the meantime, Desmond could be looking closer to learn from local struggles and policies currently in action. This would both help explain why some areas have more evictions than others, and help his readers, listeners, and viewers better address the crisis in their respective communities. The Eviction Lab is doing important work highlighting the scope of evictions nationally and raising public attention. Still, there is much work it can do to improve its data, analysis, and policy impact through meaningful engagements with local community organizations. Our critique of Mr. Desmond is grounded in our community work and our academic work. Most of us are both academics and organizers with local community advocacy groups. Several of us are members of the Anti-Eviction Mapping Project (AEMP), which has been analyzing and mapping evictions in the San Francisco Bay Area since 2013, and that has recently expanded to Los Angeles and New York City. AEMP is part of several local and national coalitions and dozens of community partnerships, and has heard numerous critiques from smaller anti-eviction groups throughout the country of the extractive practices we discuss. Graphic on main page: “Narratives of Displacement” mural. Source: Shelterforce. 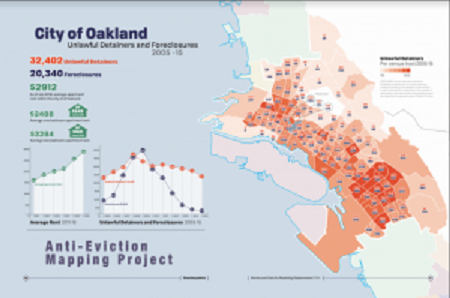 Graphic on this page: Oakland Evictions. Source: Anti-Eviction Mapping Project.